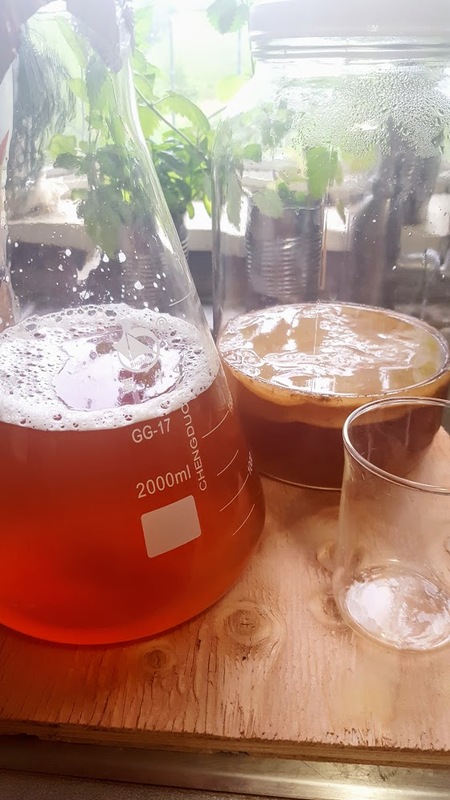 Kumbocha How To Brew / Part 1 and 2 – SUPER FERMENTED TEA | Kodiak Brewing: Beer, Wine, Cider, Mead Blog. Kumbocha is not beer, it is a probiotic drink or basically a fermented tea. There are many health benefits to Kumbocha and it is an ancient drink originating somewhere from the Asian region around Japan, hard to say exactly from where. Kumbocha is also a detoxer, it will clean your system out of the many toxins that have stored in your body over time andy keep it clean. If you have never drunk Kumbocha, go to a store and get some and see if you are going to like it, because there are small amounts of people who don’t do well with it or like it. Again, it will detox your body, which means that you *might* get the runs, (bathroom visit), become bloated, not feel well, in the beginning – but this is all temporary for most people and not everyone reacts to it, you might not. As far as the instructions, it is much easier to just record a few videos on YouTube, than write a bunch of rules, so that’s what I have done, please watch them below. The recipe, we will not post ours, not because it is a secret, but because we want you to explore and do some research on your own and through that exercise, you will find your own recipe and learn much about Kumbocha. Also, watch more videos on the benefits as well. This entry was posted in Miscell, Uncategorized and tagged brewing, kumbocha. Bookmark the permalink.